I put this little kit together, like I said, so it's easy to grab & run with. Normally I keep it in my night stand (a new addition from the what's in my nightstand post here) so I can remember to do moisturize & take care of my hands before bed. Before this I kept a random bottle of lotion but that seemed not to be enough, adding the cuticle oil has really helped with hangnails & the tender skin around my cuticles. I feel like that gets super dry as well. This little kit has everything I need for quick moisture & maintenance all wrapped up in an old Ipsy make up bag - I knew those things would come in handy for something! 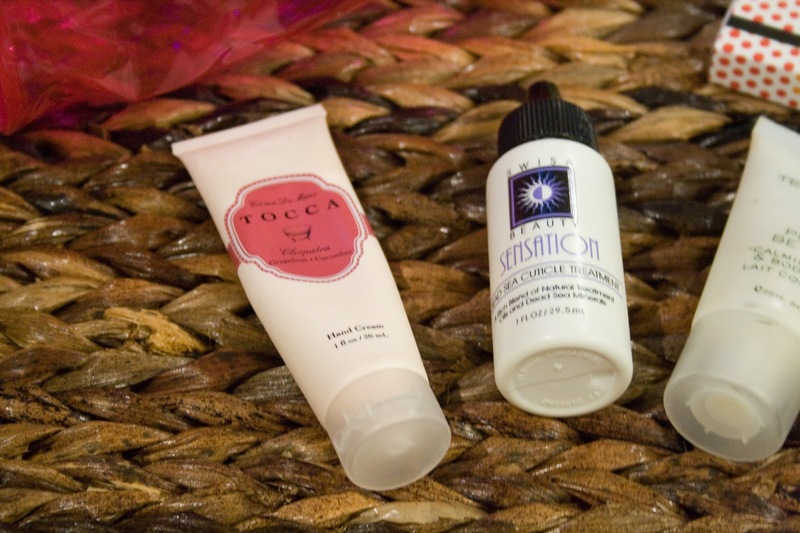 The first product here is the Tocca Cleopatra Grapefruit + Cucumber Hand Cream. This stuff smells divine! I'm really loving the cucumber scent right now, it's never been a favorite before but I'm suddenly all about it. I got this in a Birchbox one month & instanly fell in love. It's hydrating & non-greasy. I love that it absorbs very easily & I can open doorknobs after putting it on. Cuticle oil has suddenly fallen back into something I use regularly as well since my skin is dry & flakey. I also work with paper all day long - touching it every two seconds - so that dries out my finger tips. I don't if the two are neccessarily related, but I think they are. So cuticle oil has saved my tender skin from the pain of hangnails. I feel like the deep moisture of the cuticle oil is amazing. The current one in my kit is something I got as a part of another nail kit a while (like a long while) ago - it is Swisa Beauty Sensation Dead Sea Cuticle Treatment. 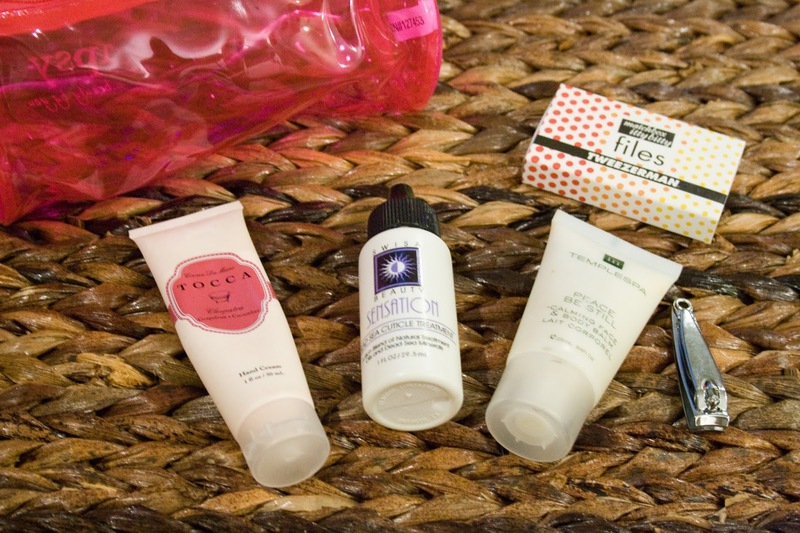 Another lotion in my little kit is something Zach grabbed for me from a hotel he stayed in. In fact every time he comes upon these TempleSpa packs he snags them. They also have a calming fabric mist that smells so relaxing - I love to spray it on the bedding when I can't sleep. So heavenly & relaxing. This lotion is the TempleSpa Peace Be Still Calming Face & Body Balm. There isn't a scent description on the tube anywhere & honestly I can't pin point it, but the smell is so relaxing. It's a deeper scent & I love it before going to bed. I've never used it on my face though, I'm scared I will break out! 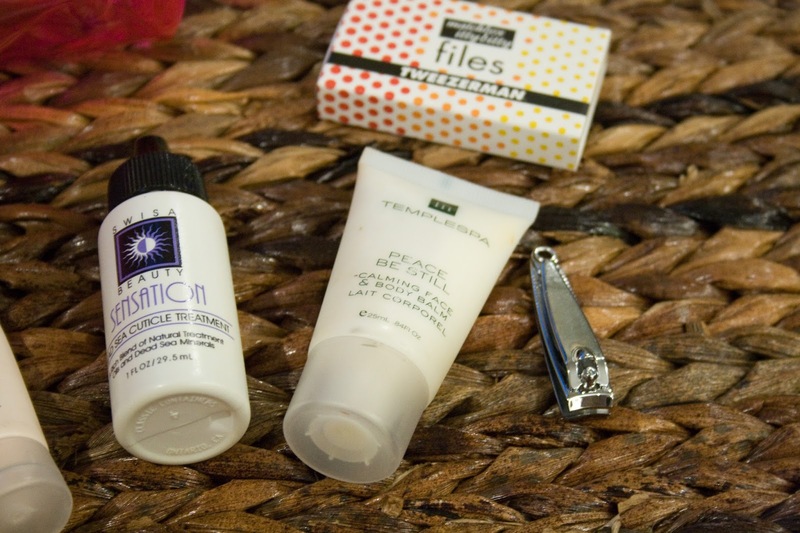 Then of course for any maintenance that may need to be done I have a small nail clipper & a small box of TweezerMan nail files that I also got in a Birchbox one month. After all my hard work to get my hands & cuticles refreshed and moisturized it's time for a holiday manicure. Of course I turned to a classic red & a bit of glitter. I used my favorite base & top coat from Icing - the Do It All Topcoat - that sadly they are discontinuing. Honestly, I don't know if you'll even be able to find it. I picked up the last two on clearance last time I was in an Icing. So sad. I then used the Nicka K polish I received in Ipsy bag this month. I topped my ring finger off with a bit of a glitter polish from Sally Hansen I received, complimentary, in the Violet Vox Box from Influenster. I like this Triple Shine polish mainly because even thought the glitter is in a blue tinted base it really comes off as pure silver glitter. Great for sparkly holiday-ness just around the corner! What are your nail care must haves? How do you battle the cold weather? Lovley little kit :) I have super sensitive skin and my hands go through the mill in the winter.